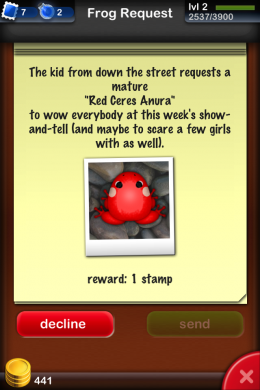 Raves about newly grown crops or eager sets of farm animals seem to spread like wildfire in the land of social gaming, but when Pocket Frogs entered the market they spun a couple things around a little bit and added a more action to keep gamers occupied. 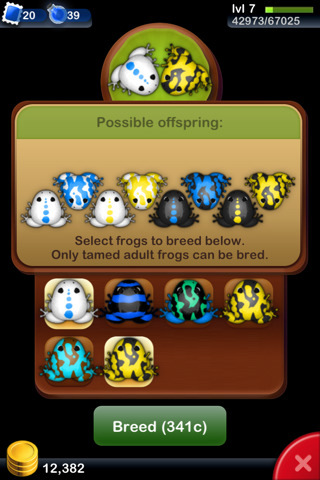 Instead of the typical crop growing routine, the premise of NimbleBit‘s Pocket Frogs is all about raising and breeding frogs. You’re in charge of a nursery of frogs and it’s your job to keep them happy, breed them properly, and either sit back and enjoy or make a bit of fake money. The premise is simple, but when you start to accumulate a bunch of frogs (the game limits you to 50) everything is a little bit more difficult to keep track of. First of all, your frogs have a happiness meter. Being the sensitive type, this affects me more than any other single component in the game. You can access each individual frog’s overall status by tapping on it in the scenery screen. This shows you the breed, maturity, value, time left before that frog grows again, and gives you the opportunity to sell your frog, move it elsewhere, or of course, raise the happiness percentage of the frog by bringing it to the pond. If you really get into this game, the pond is where you’re likely to spend most of your time. 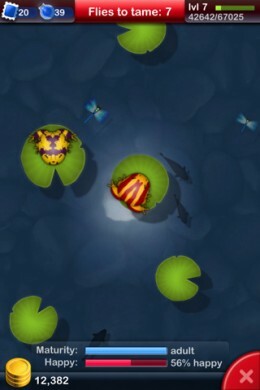 Tapping on lily pads gets your frog to jump from one place to another in a fun, well executed setup. 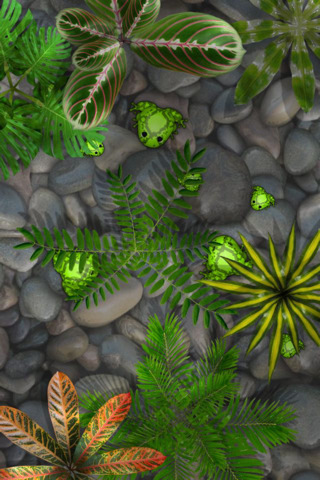 The simple act of tapping creates great splashing sound effects so this “keep busy activity” is actually enjoyable. Making sure your frog’s happiness increases is the direct result of the path of dragonflies in flight. As you hop from one lilly pad to another though, you can also encounter other frogs and breed with them, find presents, and more. This is a remotely fun past time for not only the breeder who carse about their frogs’ happiness levels, but also for those who want to speed up the game a little bit without spending cold hard cash. 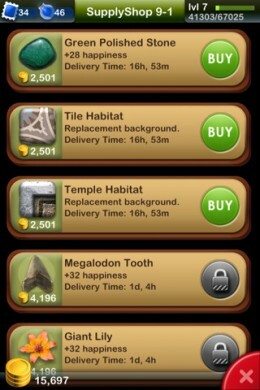 Because of course, like any social game, Pocket Frogs is all about time and money. It takes awhile for your frogs to hatch and then even longer for them to mature to their best value. 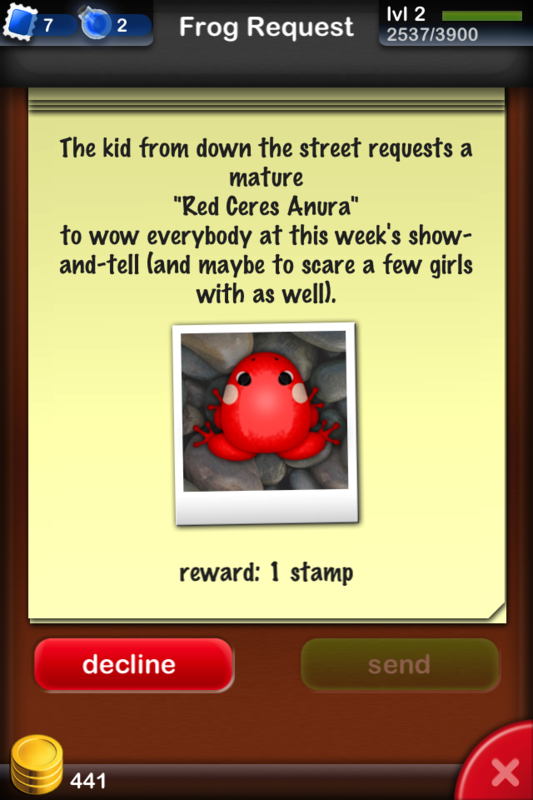 You can buy the ability to speed up the process through in app purchases, but otherwise Pocket Frogs is another variation of the slow cadence of social gaming. 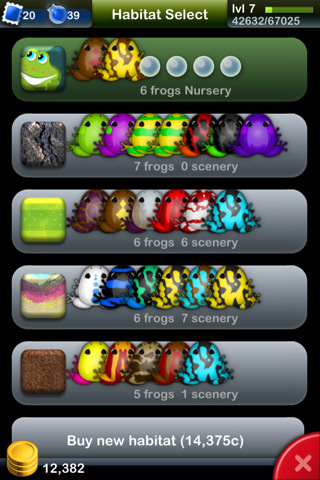 The pond keeps you busier than most social games, and you can shop for items to accessorize your play pen, answer requests for specific breeds of frogs, wait for items in your mailbox, log into Plus+ to check on your neighbors and much more. All said and done you can’t lose on the initially free price tag. It’s a nice addition to the social gamer’s arsenal, but if you’re not already into that specific type of game, I’m not sure how likely Pocket Frogs will be the title to convert you. Bottom Line: Pocket Frogs is a fun social game for the iPad with more robust gameplay than most of its competitors. It’s a well executed freebie with the capacity to gulp up hours of your precious time.